Yes, our favourite comedy act is back on the road. Now, your turn. 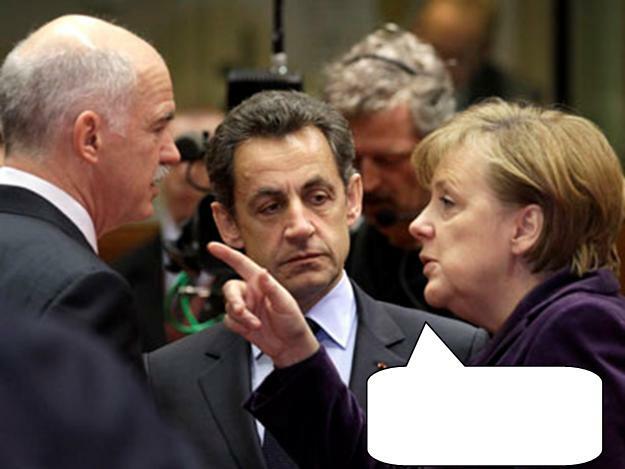 Compo: what is the fun-loving Frau saying this time ? Answers in the comments, please. Prize - a genuine "Merkel" bailout + austerity package of your very own ! Worth over € 120 billion !! You see what you've done? Now I have to give this little Frog 500 billion! Gordon Brown would only ask for half the amount you're looking for... and he has a nicer smile. We were offering you a bung, not a bunga-bunga. 'Ere, Sarky, I fink 'is 'tache is fake. And don't give your serfs a referendum on this, we never do! Remember, Paps, that's my towel laid out on your country now. For you, Stavros, ze euro is over. Now look what you've gone and done! "You know...Now I look closer...Silvio was right..She does have a beard." You can bugger off with your democracy anyone would think you invented it. "Ein Volk, Ein Reich, Ein Euro!" You look like you don't need any more haircuts, baldy! You sly dog. Let me give you a hug. You were not supposed to go Greek on us! 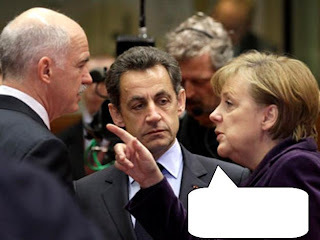 Und now madam, vould you plees point at zer man who you haff seen rayping ze corpse of ze euro und zen urinayting upon it. "Zat is himm. Slapphead mit der bogbrush musstash. I vould know himm anyverr."